Used by small and large organizations worldwide to simplify supply workflow, improve procurement management and reduce inventory levels. CommunicatorBase links between your internal systems and your suppliers. By easily feeding in quantity on hand and sales, CommunicatorBase helps you create smart orders that will arrive just in time, reducing inventory levels to a minimum. Suppliers receive orders and create shipments back to you. All of the orders statuses, shipments and payments are tracked from one simple interface. This tool will revolutionize the way your organization orders and manages inventory and supply. Get easy access to all of your information and build an arsenal of suppliers that will continuously communicate with you as orders and shipments flow back and forth. 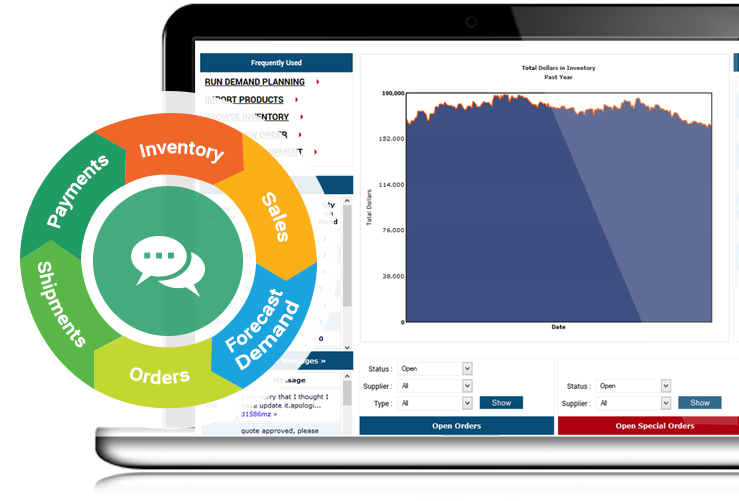 Using the demand planning forecasting tool you will be able to order easily and efficiently saving you time and money, keeping orders 'smart' and 'small' and inventory levels at a minimum. We help our customers manage their Supply Chain, keeping suppliers in check on every order. Easy 3 step process and you are ready to go live! We help our customers manage their Supply Chain. We do this by giving them a platform they can collaborate and streamline the purchasing process: forecasting demand, getting price quotes, managing orders, making payments and receiving shipments. By collaborating and centralizing all of the supply chain activities buyers can focus on reducing inventory levels, getting better performance from their suppliers and keep cost of goods to a bare minimum. Easily manage multiple suppliers with hundreds of orders and shipments in one collaborative interface. Integrates with QuickBooks for easy importing of sales and inventory data, and reduce data entery by importing POs and Invoices back into QuickBooks. Use innovative algorithms to forecast demand on thousands of items. 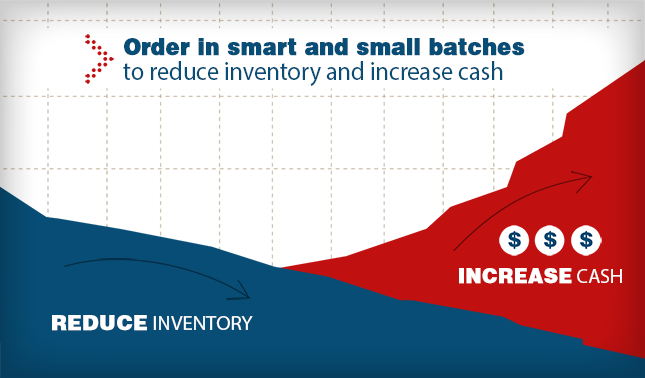 Make small frequent orders to reduce inventory levels to a minimum. Get price quotes for orders from multiple suppliers allowing you to get the best possible cost reduction and higher gross margins. 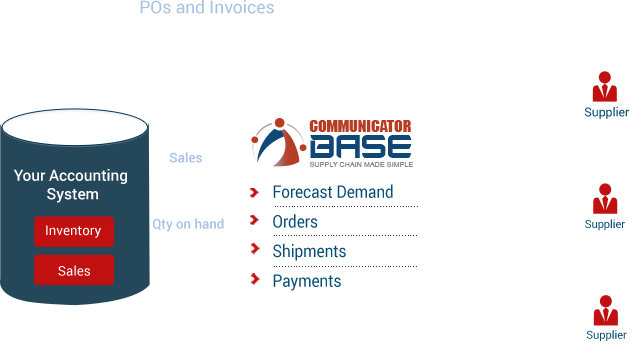 We based the CommunicatorBase demand forecasting algorithm on TOC and Lean Manufacturing models so you can make small frequent orders to keep your inventory levels low and order just in time. Suppliers love CommunicatorBase! They love it because we make everything transparent and organized. They can follow the orders coming in, contact customers on updates or unexpected delays and communicate about orders and shipments on the way all in one convenient spot! Suppliers can set payment terms and follow the process from a birds-eye-view without having to look through excel sheets and email chains. This transparency lifts trust and aids in cultivating long-lasting relationships among overseas suppliers and their customers. Suppliers can enjoy the ease of collaboration with their customers for free! No credit card required. They can keep tabs on orders in the pipeline, create shipments, and follow the payments flowing from their customers. Step 1: Import your sales and inventory information via QuickBooks or any other accounting package. How to import my inventory data? How do I invite my suppliers? Using Theory of Constraint methodologies in Supply Chain Mgt.